Hilarity will erupt and philosophy will ensue as low-tech visual tricks enhance an informative, thought-provoking and entertaining lecture about the Master of the Macabre. Portland, Oregon — February 25, 2010 — One handheld video camera. One very small movie set. And one guy who knows more about Alfred Hitchcock than ought to be allowed. That’s the gist of Alfred Hitchcock Geek, a one man show written and performed by Joel Gunz, with stage direction and special effects by visual artist Lane Hunter. A preview performance of Gunz’s full-length act will take place in connection with Portland Center Stage’s live theater production of Hitchcock’s The 39 Steps during its “Hitchcocktail Hour” preshow events on selected Friday nights, beginning at 6:30. The preview events are free to the public and take place in the mezzanine of the Armory Theater on March 5, 12 and 19. Gunz believes that Hitchcock was the Shakespeare of the 20th century and he’s willing to go to any lengths to prove it. Interacting with an array of ingenious low-tech visual tricks, he will deliver an informative lecture about the director’s films while hanging from the roof of a building (see Vertigo), peeping into his neighbors’ apartments (see Rear Window) and participating in other famous scenes first conceived by the Master of Suspense. Shooting a miniature city of his own creation with a hand-held video camera, Hunter will project scenes on the wall behind Gunz that will appear to come to life. The technique harkens back to the special effects techniques used during the classic film era, before the advent computer-generated images. Hunter will share the stage with Gunz; like an old-time radio show production, half of the fun will come from watching him do his visual magic. These devices are the perfect metaphor for the point Gunz is making with his show. Alfred Hitchcock Geek pulls the curtain back to reveal the inner workings that have made Hitchcock’s movies fascinating to generations of film lovers. It demonstrates why his films continue to inspire filmmakers to this day. Hitchcock’s films will be placed in their historical context, as Gunz shares his groundbreaking research, drawing fascinating connections between Hitchcock and the work of such artists as Edvard Munch, Edward Hopper, Salvador Dalí and many others. By the end of his show, audiences will be convinced that Hitchcock’s talent and influence was indeed Shakespearean. 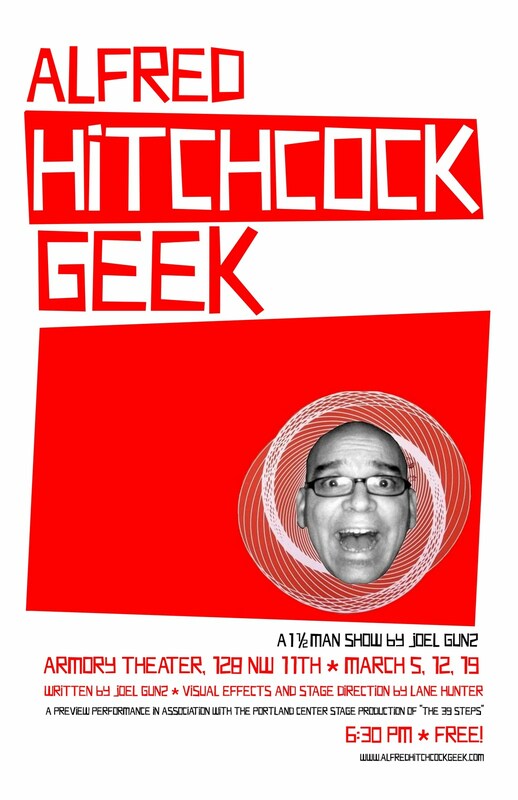 After several years of study and association with other film scholars, Joel Gunz launched his blog, www.alfredhitchcockgeek.com in 2004. Since then, he has built an international audience and won several awards for his writing and research. In 2009, he was twice invited to speak at New York City’s Broadway production of The 39 Steps and he plans to take his full-length show back to New York in 2010. More information about the show can be found at the Alfred Hitchcock Geek Facebook fan page. Lane Hunter’s background in the creative arts extends in several directions. An accomplished and critically acclaimed dancer and choreographer as well as a set and costume designer, he has delighted audiences around the world. Hunter performed with Portland’s Bodyvox dance troupe for several years until he left to found Lane Hunter Dance in 2009. His work can be found at his website and on his Facebook fan page. "By the end of his show, audiences will be convinced that Hitchcock’s talent and influence was indeed Shakespearean." Thanks, for sharing the links too.